Back on August 3rd shares of Cerner Corp surged following a solid second quarter earnings report. The healthcare/software company finished the session with a 6% gain after opening with a huge upside gap. This powerful move pushed shares to a six month high leaving behind layers of support in the process. Since then CERN has had difficulty maintaining the post earnings momentum. The stock spent the remainder of August drifting lower while tracing out a healthy consolidation. 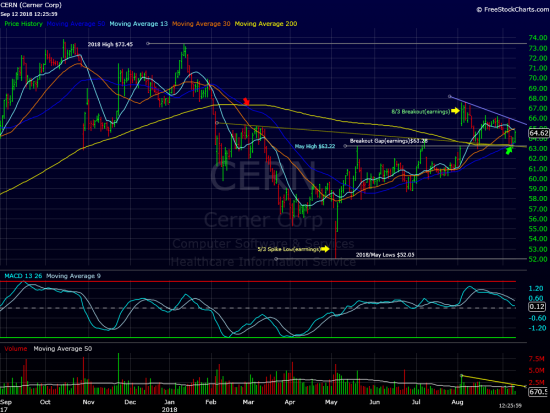 In September the pattern continued but the action of late has put CERN in a very low risk entry position. A week and a half after CERN’s post earnings breakout the August 3rd gap was filled. The stock retested this key area this week and is now beginning to lift. It’s quite clear the stock has very solid footing underneath. Trading notes: The $63.00 to $64.00 area is developing as a major support zone. This area includes the May/July highs as well as the post earnings breakout gap left behind on the morning of August 3rd. Also in play in this zone is both the 50 and 200 day moving averages. These two moving averages have traced out a bullish cross this week. We consider CERN a low risk buy near current levels. A close above last week’s high($66.05)is a key hurdle. On the downside, a close back below $63.00 would violate this week’s low sending a clear warning sign that more consolidation is ahead. At time of publication we are long CERN in some managed accounts.